Wheelersburg’s Alaina Keeney battles West Carter’s Morgan Berry for a rebound during the second half of Saturday’s 56-50 win at Ironton High School. 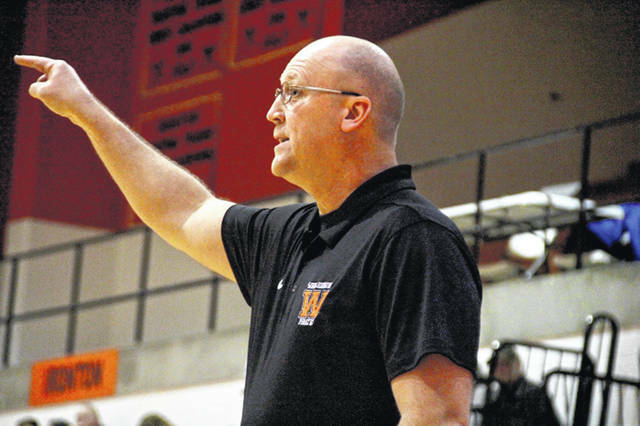 Wheelersburg coach Dusty Spradlin gives instructions during Saturday’s 56-50 win over West Carter (Ky.). 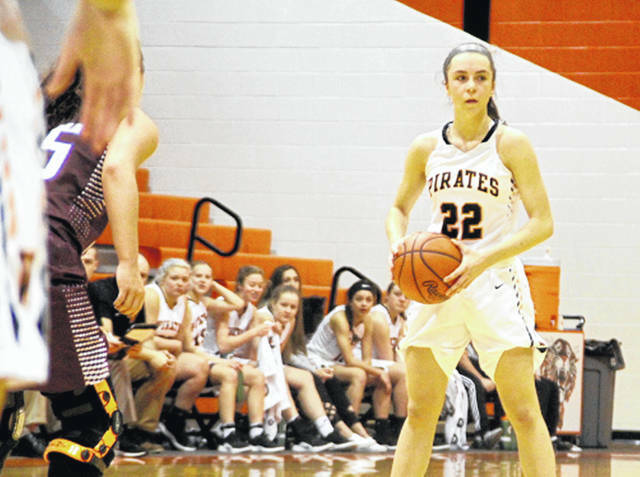 Sophomore Ellie Kallner scored 12 points, grabbed eight rebounds and passed out four assists during the Pirates’ 56-50 win over West Carter (Ky.) at Ironton High School, Saturday. IRONTON – On any regular night, Wheelersburg’s girls are a tough out. But when the Pirates play freely with all of their worries set aside … say, like a non-league contest against a team that has no bearing on any type of postseason draw … they’re extremely dangerous. 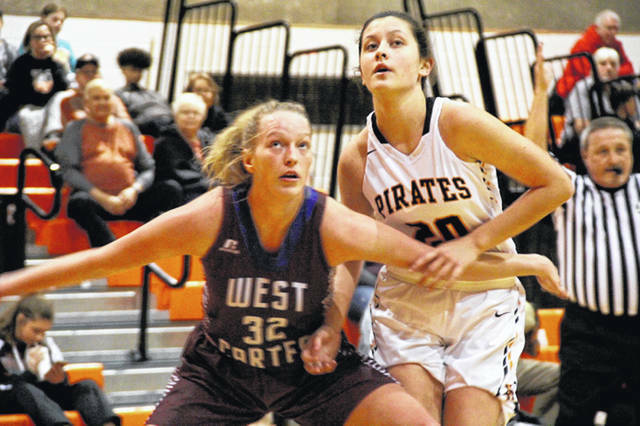 In a non-league contest against West Carter (Ky.), a team that has no bearing on the Pirates’ eventual postseason draw, Wheelersburg used fun as a source of success in a 56-50 win. The Pirates (15-4) passed out 12 assists on the day. Kallner tallied a team-high four of those herself, alongside 12 points and a team-high rebounds. All in all, it was the sophomore’s best individual performance all year long. The same could be said about senior Karlie Estep, who tallied eight points and seven rebounds. Estep grinded for 32 minutes under the rim, doing the little things that don’t show up on the stat sheet. There was, however, a small time period during the win where Estep became frustrated. Her anecdote to the problem was a simple concoction of effort and will. After Kaylee Darnell scored the game’s first basket at the 7:40 mark in the first quarter, Wheelersburg didn’t have a lead again until late in the second. The Comets, led by Kallie Burchett, had a 17-14 lead after the first quarter … but that didn’t hold for long. With 4:21 left in the second, Estep scored to make it a 21-18 ballgame before Darnell drilled a 3 to tie the game. With 2:15 left before halftime, Estep scored again to put Wheelersburg ahead 23-21. Ellie Kallner then scored with 26.2 seconds left, sending the game into halftime at 25-21. With Wheelersburg leading 34-27, West Carter went on an 8-0 run to take a 35-34 edge. With 30.2 seconds left before the fourth, Abbie Kallner hit a 3, putting Wheelersburg ahead 39-38. Abbie Kallner scored again at the 4:15 mark in the fourth, making it 44-42, and the Pirates never looked back. Down the stretch, both Kallners and Kaylee Darnell hit their free throws to put the win on ice. Abbie Kallner and Darnell led ‘Burg in scoring with 15 points each. Kallner added five rebounds to her totals while Darnell tallied eight boards and four assists. Ellie Kallner ended the day with 12 points, nine rebounds and four assists while Estep had eight points and seven boards. West Carter was led by Kallie Burchett with 21 points and five rebounds while Morgan Berry finished with 13 points, six boards and two assists. The Pirates will attempt to keep the training rolling in conference play Monday, traveling to Valley. Wheelersburg: 18-45 FG, 10-17 FT, 7-14 3pt. (A. Kallner 2, E. Kallner 2), 35 rebounds (E. Kallner 9), 14 turnovers, 12 assists (E. Kallner 4). Scoring: A. Kallner 15, Darnell 15, E. Kallner 12, Estep 8, Irwin 3, Keeney 3. West Carter: 19-47 FG, 7-13 FT, 3-12 3pt. (Stone 1, Berry 1, Burchett 1), 23 rebounds (Berry 6), 11 turnovers, 7 assists (Stone 4). Scoring: Burchett 21, Berry 13, Stone 9, Adkins 4, Gilliam 2, Bear 1. After taking an early 9-2 lead, Minford allowed Russell (Ky.) to go on an 18-0 run Saturday afternoon at Ironton High School, which was eventually their downfall in a 49-39 loss. The Falcons (13-6) were led statistically by Ashley Blankenship’s 10 points and 12 rebounds. Caitlyn Puckett added 13 points and Hannah Tolle had nine. Minford: 13-43 FG, 8-14 FT, 5-14 3pt. (Tolle 3), 26 rebounds (Blankenship 12), 17 turnovers, 7 assists (Slusher 3). Scoring: Puckett 13, Blankenship 10, Tolle 9, Shonkwiler 4, Slusher 2, Watters 1. Russell: 16-44 FG, 16-19 FT, 1-11 3pt. (Ross 1), 27 rebounds (Ross 8), 12 turnovers, 9 assists (Ross 3). Scoring: Sanders 20, Ross 13, Blevins 8, Morris 4, Steele 4.